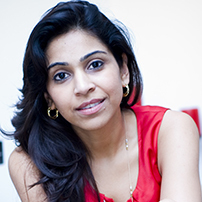 Anisha Singh is a noted entrepreneur, leading one of India’s largest marketing platforms for local services. She is also an international speaker on entrepreneurship and passionate about women’s rights and issues at the workplace. Anisha Singh is the Founder and CEO of mydala.com. The company started under her leadership in 2009 and since then mydala has grown to become India’s largest local services marketing platform. Anisha began her career with the Clinton administration in Capitol Hill, helping women entrepreneurs raise funding for innovative women-led businesses. She then joined Centra Software in Boston where she facilitated the setting up of e-learning ecosystems for Fortune 500 companies. After returning to India, she launched Kinis Software Solutions, which provides digital solutions for real estate companies in the US. mydala is her second company and has worked with more than 130,000 merchants and 38 million registered users across 209 cities. mydala leads the market with 200,000 transactions per day and 85% of the traffic comes from mobile channels. She won the Zee TV Outstanding Young Entrepreneur 2016 and the e-INC / eTales Awards for e-Commerce Entrepreneur of the Year 2016. She is a noted expert on entrepreneurship, women equality at the workplace and e-commerce, having spoken at international conferences like the Mobile World Congress, Wired, Tedx, the Boao Forum, SeedStars Summit and Start-up India. Anisha sits on the advisory council for the Kogod School of Business, American University, of which she is also an alumna. She is on the jury of the Cartier Women Initiative Awards and Station F, a business incubator for start-ups. She is also a judge on the start-up reality show called Dropout Pvt Ltd. on MTV. Her focus now is towards building a future where women’s success stories are accepted as the norm and not the exception. An active mentor and angel investor, she is currently planning operation Recast, an event that will provide a platform for shortlisted female entrepreneurs to pitch their business ideas to angel and venture capitalists. Anisha holds a Master’s degree in political communication and MBA in Information Systems from American University, Washington DC.